It’s Yorkshire Day, and we’re very excited as today is dedicated to celebrating God’s own country. As one of the top York letting agents, we naturally pride ourselves in knowing the ins and outs of our city. To share what makes York so special, we’ve done a bit of digging to collect some of our top reasons for loving the city of York. Enjoy and have a reet good Yorkshire Day! Before we delve into the finer details of York, there’s a lot of great stats that confirm what makes York so popular. It’s a key tourist destination and has experienced a significant boost in employment especially in the tourism and restaurant industries. It’s also home to one of the UK’s largest 18-24 year old groups, meaning it not only attracts but keeps this generation, which will soon be highly dominant consumers. It was also voted as the No.1 best place to live in the North by The Times in 2018. 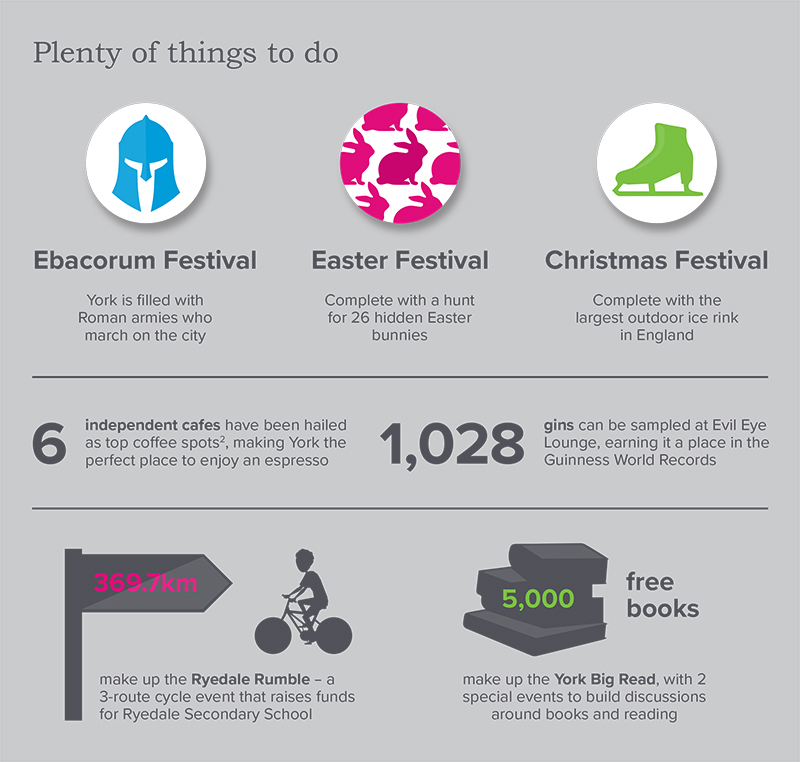 These are some pretty good reasons to be excited about York , but what else makes it such a lovable city? Continuing the growth trend from the first glance, York offers young renters and young families plenty of opportunity for the future. Education is at the heart of York, but this is backed up by employment opportunity. In 2017, 83% of graduates were either in employment or in further education after leaving the University of York. On top of this 94.2% of children were given their first choice of primary school. The city is even home to the fourth oldest school in the world! St Peter’s School was founded in 627 AD. And this is just the tip of York’s heritage saga. There’s a lot of rich and diverse heritage in the city of York. York’s gone through many changes since it was first founded, including changes to it’s name. The city was founded in 71 AD by the Romans as Eboracum, then the name was changed by the Danes to Jorvik in the 8th century before becoming known as York when William the Conqueror arrived with the Normans. Above are some of the most famous heritage sites to point out, which all hold some impressive records of their own. However, York Races can’t be missed out when discussing the city’s heritage. It’s home to 180 stables with the first official race taking place in 1731. Nevertheless, races had been going on in the city since 1530. Attendance to York Races is always high with around 350,000 race-enthusiasts visiting each year. With all this vast heritage and history in one place, it’s not too surprising that 504 hauntings have been recorded in York. If you’re curious to find all York ghosts responsible for the hauntings, there are over 10 different ghost walks and experiences across the city. Including a ghost walk on a vintage bus. York’s famous for being a well-connected city, and there’s more than one way to stay connected. The fast broadband explains the recent rise in digital and creative agencies in York. For these agencies it’s also handy that London is only 2 hours away. Having free wifi on buses is also great for staying connected and getting around the city. Though if you want a bit of a digital detox or an alternative to travelling through the city, there’s a strong cycling community in York. There are over 20 cycle routes, and York is home to 12 cycling community groups. We’ve experienced a very active community across the many areas of York that our property experts have been working in. It’s lovely to see and a joy to be a part of. Throughout the year, there are key seasonal events that are supported by York City Council. There’s a strong sense of collaboration between local communities and local businesses. For example, the Easter Festival is also home of the York Chocolate Festival. And the York Big Read is part of a wider “York Big” phenomenon. There’s also the York Big Sing, which aims to bring people together through song by providing 11 free singing workshops across the city. The aesthetics of York are truly inspiring as there’s a charming balance of old and new architectural styles. The city embraces it’s heritage, while looking to the future. New homes are on the rise to meet the rise in residents of the city. The York Central Project is a highly exciting one, as it’s not only about brining new homes and new jobs to the city, but will include some exciting cultural spaces too. If this Yorkshire Day infographic has convinced you to get a home in York and you’re looking to rent a property in York, we can help. Get in touch with our York letting team on 01904 631 631 or contact the team via our callback form here. 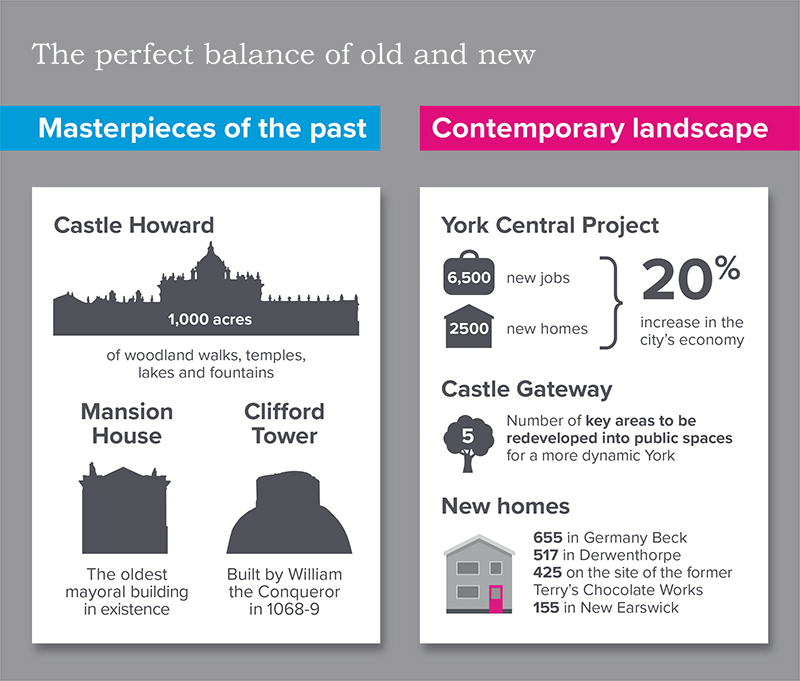 View the full infographic of why we love York below or if you’d like to download a copy, you can access it as a pdf file here.